The H.O.P.E. 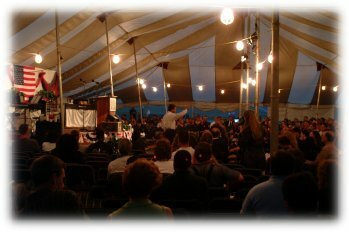 Ministries Tent Division began as God provided the tent in May of 2000. Seating approximately 2000, it exceeds the capacity of many church buildings. We feel that the tent atmosphere transcends church and denominational “barriers” that we often find ourselves in. It helps us mentally breakout of our daily routines as well as our Sunday “rituals”. It’s a place where both the poor and rich are presented on equal terms. Make no mistake; this by no means is a replacement for the local church, but rather a supplement to it, a catalyst for revival. Our goal is to facilitate two dozen revival meetings all over the United States each year through the working of the Holy Spirit in willing pastors. H.O.P.E. provides local pastors with the tent, and provides guidance on everything from obtaining temporary structure and zoning permits, when necessary, to locating property for the tent site.